Palestinian political prisoners in Israeli prisons have launched a mass hunger strike on 8 April 2019. The call for the hunger strike comes after months of serious deterioration in detention conditions specifically after the Israeli Minister Gilad Erdan formed a committee precisely to lower the standards of detention conditions for Palestinians. The peak of this deterioration was the several violent raids with the use of excessive force against prisoners in three different prisons, Ofer, al-Naqab, and Rimon. The hunger strike started with the five prisoners, Wa’el Jaghoub, Muhammad A’rman, Zaid Besisi, Hussain Derbas, and Akram Abu Baker. 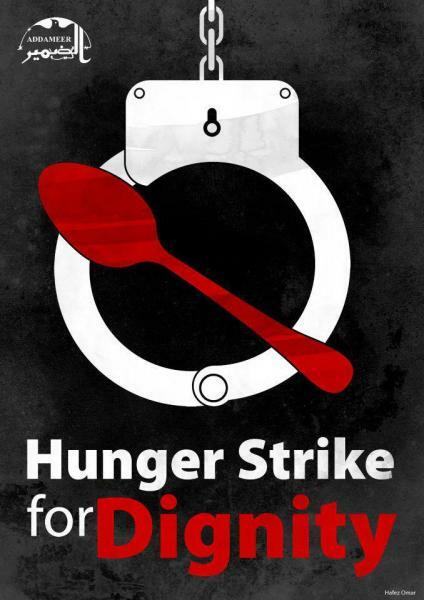 Since the launch of the strike until this moment tens of prisoners have joined the hunger strike and we expect the numbers to increase in the coming week. The hunger striking prisoners’ demands include: install public phones in all prisons; remove all the new cell jammers from prison sections and rooms; relocate all the prisoners who were moved from their sections recently as a punitive measure; cancel all the new measures taken by the Israeli Minister Gilad Erdan and his new committee; allow family visits for the families who are banned visits for security reasons including the families from Gaza Strip, proper medical care; transfer female prisoner from Damon prison to another prison where women prisoners’ needs are met in accordance with international law standards; to improve detention conditions for children; to put an end to the policy of isolation; to improve the conditions of bosta (prisoner’s transfer) and waiting sections. As the strike begins, Addameer Prisoner Support urges supporters of justice around the world to take action to support the Palestinian prisoners whose bodies and lives are on the line for freedom and dignity.